I have a little twig tree in my foyer where I try and hang ornaments from each season. I just took off the coins from St. Patty’s Day and now it is time to hang the Easter eggs. Each year the eggs are unique. 2014 is the year for the crackled sparkle/metallic eggs. Each egg is base coated in either sparkle or metallic acrylic paint. Then it gets fun! When the basecoat is dry we apply the crackle finish and pastel color that allows the metallic or sparkle paint to peek through. Finish with a gorgeous Bowdabra mini bow and hang on the tree. Wanna make some too? Follow along with the easy tutorial. 1. Make a hole in the bottom (wider end of the eggs) with a small awl or nail. Insert a barbeque skewer in the hole. You will use the barbeque skewer to hold the eggs while you paint and crackle them. Afterwards you can stand them up in a vase or container to dry. 2. 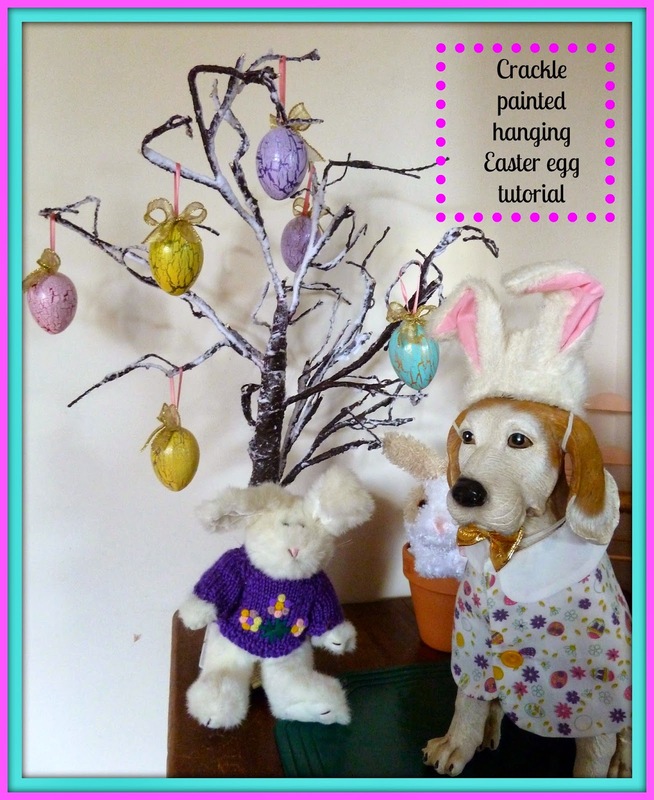 Using a small paintbrush brush a coat of metallic or sparkle acrylic paint on the entire egg and let dry. Repeat with a second coat. 3. Using the crackle medium brush a thin coat of medium on the dried egg covering completely and let dry for 20-30 minutes. Do not dry completely. The medium will be slightly tacky. 4. Immediately brush on a coat of pastel acrylic paint in a corresponding color. Vary the direction of the brush. The direction will determine how the crackles look. Do not over brush. Set the egg aside and let dry. In a few minutes you will see crackles forming. 5. When the egg is completely dry apply a coat of gloss acrylic finish and let dry. Be creative and make several color eggs or make them all the same. I like to vary the base coats and top coats. 6. Remove the skewer. Cut a 6-inch piece of thin ribbon. Add a dab of tacky glue on the end of the egg with the hole and using the skewer push both ends of the ribbon into the hole one at a time to form a loop. Let the glue dry. 1. Gather your supplies. Cut ten inches of Bowdabra bow wire, fold in half and insert into the mini Bowdabra. 2. Cut about 10 inches of ½” wide gold wired ribbon and place in the Mini Bowdabra to create a 1 ½” tail. Next fold the ribbon to form a loop at the 1” mark. 4. Scrunch the ribbon with the mini Bowdabra wand. Take the tails through the loop and pull tight. Remove the bow from the Bowdabra and tie a knot. 5. Fold the end in half and cut at an angle to make a pointed tail. Repeat with opposite end. Fluff up your bow and trim off the excess bow wire and use a hot glue gun to attach to the top of the egg. Note: Don't have a twig tree? It's easy to make one. Get a terra cotta pot fill it with aquarium gravel and insert a medium piece of a tree with several thin branches. Remove any leaves and hang your eggs. This is a great tutorial. And these eggs are gorgeous! I really love them! Glad I found you on Serenity Saturday! Very cute idea! It's something that I could do. I like that! Thanks for sharing with Countdown in Style!